We've been in Kauai for five days of fun, sun, rain, beaches, breathtaking scenery, and food, glorious food. We've had some good meals, some not-so-good meals, and some sublime meals. The better restaurants are pricey, so if you come here, be prepared for a little sticker shock at some of the restaurants. We usually stock up on breakfast items and simple lunches and save a little money that way, and enjoy sampling different restaurants, while returning to some old favorites as well. We started the week with lunch at JJ's Broiler, a casual beachside restaurant featuring burgers, salads, and sandwiches, and featuring steaks. They have a large, open deck where you can watch surfers while enjoying a nice (but in our case, breezy) al fresco lunch or dinner. I had a toasted chicken panini with tomato, mozzarella, and pesto. Not exactly Hawaiian, but tasty and not terribly expensive. Frank had the Kalua Pork Wrap, featuring the ever-popular pork dish that is featured at luaus. One of the nice things here is the that kids meals are served in a little sand bucket with a shovel, so you have a functional beach toy to take away. One of our more memorable (though not favorite) meals was at the local favorite, Oki Diner. Oki Diner serves local Hawaiian fare, so this is not the place for a dieter. 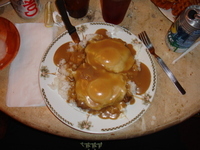 Frank had the Loco Moco, a concoction made of white rice, layered with ground beef, two fried eggs, all smothered in gravy. Real "stick to your ribs" type stuff, and probably something that will hang around in your digestive track for a week or two. I had kalbi, Korean-style barbecue short-ribs, which were sweet and just like mom makes. I think I definitely had the best meal of all of us, since Alex complained that his grilled cheese was "terrible," although I amnot sure how a grilled cheese sandwich could be classified as "terrible." Grandma had what was billed to be lemon chicken, but was overly battered, thin deep fried stips of chicken with a gooey sauce. Everything was edible, but gourmet cuisine it was not. It was inexpensive, but I know that there are other places to try local food that have to be a notch or two up. One local place that was a big hit with everyone was Halohalo Shave Ice, where you can get shave ice (sort of like a finely tuned sno-cone) with ice cream at the bottom. The ice is shaved so thin that it is light and fluffy. If you go here, you have to ring the bell for service or they think you are waiting for a spot at the lunch counter. 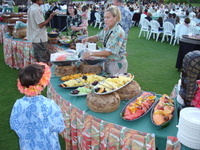 What would a trip to the islands be without an overpriced luau? We were limited to Thursday night for the luau before Grandma had to go back to Indiana, where it is evidently, still February. Our options were somewhat limited, and our favorite luau at Smith's Tropical Paradise was closed. So, we opted for the Grand Hyatt in Poipu, which had the standard fare of kalua pig, huli huli chicken, poi, poke salad, and taro rolls. The waitstaff kept the mai tais flowing throughout the night and nobody went home hungry. The luau featured a Polynesian dance review, but we left before the big Samoan fire dancer made his entrance. The dancers were competent, and the MC had a nice voice, but it was very much a hotel revue, on par with cruise ship entertainment. Onto the sublime...Grandma graciously agreed to babysit one night while we went out for an adult dinner at Roy's in Poipu. Chef Roy Yamaguchi is the master of the fusion of Asian and Hawaiian delicacies. 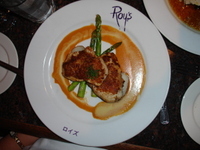 We've eaten at Roy's restaurants in Oahu, Austin, and Pebble Beach, but the one in Poipu is by far the best. The baby back ribs with a light, sweet glaze come as an appetizer, but you could feast on these alone and be quite content. We ordered the Canoe for Two, a sophisticated pupu platter with ribs, spring rolls and kalbi potstickers that are utterly delicious. For entrees, I had a lightly coated macadamia-nut sutome (swordfish) with a lobster beurre blanc that I wanted to lick off the plate. I'm not kidding. Frank had to restrain me. Frank had opakapaka, a light, delicious white fish with a shoyu/ginger sauce that was also fantastic. If you only have one thing at Roy's, go for the molten chocolate cake. Warm and crusty on the outside with a gooey hot fudge filling...Lots of restaurants have this, but nobody does it better than Roy. The only downside to eating at Roy's is that it is really, really noisy. Something about the acoustics in the place made it hard to hear, so it was not terribly romantic. Our other highlight was dining at Gaylord's at Kilohana, where a chatty, friendly waiter and a terrific wine list made for a memorable evening. I had a seafood sample plate with a buttery lobster tail, a fish filet with a tropical salsa, some grilled scallops and shrimp, all cooked perfectly. 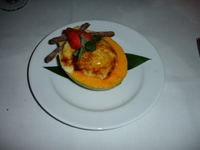 Frank ordered the papaya creme brulee for dessert, but noted that it was just a papaya with some custard that someone had blowtorched. It was lovely, and tasted good, but not exactly what he had envisioned. Gaylord's also features some nice shops with island-crafted gifts and souvenirs that are a cut above what you might find elsewhere. This was our first time at Gaylord's. We tend to favor places on the beach, so the plantation setting didn't seem that appealing. It turned out to be a lovely place, and one we'll go back to when we come back to Kauai. Our final night on the island, we dined at another new place (for us), Wahooo Seafood Bar & Grill (not to be confused with the fish taco chain). 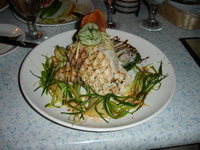 The speciality here is locally caught fish and fresh ingredients. The presentation was spectacular, the waitstaff friendly, helpful, and knowledgeable, and the ambience relaxed and subdued. I had the ahi (yellowfin tuna) in a light coconut broth with mussels and vegetables. It was light, fresh, and delicious. Frank had the wahoo with a seafood medley in another light, tasty sauce. 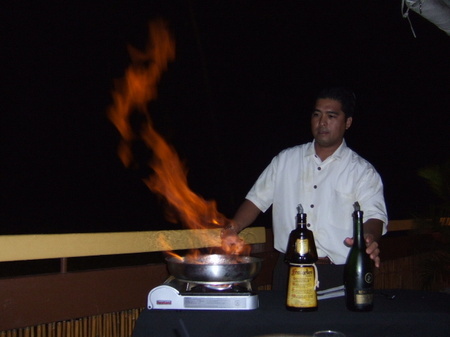 We finished up with a flaming banana dessert made at tableside with bananas, oranges, brown sugar, macadamia nuts, and Fra Angelico. One of the nicest things about the Marriott in Kauai is the tropical garden in the atrium. 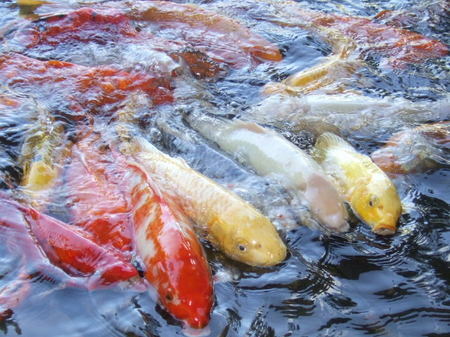 The centerpiece is a large koi pond, with over 1100 giant koi. Every morning at 9:00 am, one of the employees comes down to feed the fish. The fish put on quite a show and for a moment, the normally mild-mannered koi get crazy. They give kids a small cup of the fish food, so after the big show, kids have fun watching the fish scramble for treats. It's quite a show. On Sunday, we barely made it to the flight from Honolulu to Lihue. It wasn't that we weren't up at the crack of dawn (we're still on California time). It was that everything in this hotel seems to be on slow-motion time. No one is in a hurry, and they seem to be terribly put-out if you happen to be, say, trying to make a 10 am flight. While we waited 30 minutes for the car to be brought up from the Parking Garage on the Moon, the bellman asked me where we were headed. I told him, "Kauai." He smiled and said. "You'll like it over there. It's more laid-back than here." Dude, I wanted to say, If you people were any more laid back, you'd have Dr. House and his minions standing around you drilling holes in your head looking for signs of a tumor. Despite all the laid-backedness and hanging loose, we managed to make it to the flight and landed in Kauai after about twenty five minutes. Landing here is like taking a warm, cleansing breath. Just getting off the airplane and walking outside to get our bags had a calming effect, and any stress that might have had was released out into the wind. Even though our bags weren't on the same flight as we were, it was like, No worries. Clothes? Who needs clothes. Who cares? This laid-back thing is not just a way of life here, it's like something in the air is whispering, just relax already. Aloha from Hawaii! We arrived in Honolulu on Saturday, after a pretty uneventful flight (if you don't count the time I spent trapped in the bathroom during some extreme turbulence). 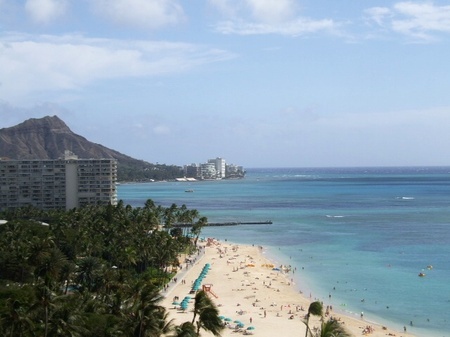 We're stopping over in Honolulu for the night, then it's a morning flight to Kauai for a week of vacation. It's Ski Week in Palo Alto, so school is closed so that kids can escape from the oppressively mild weather of Northern California to go get their fair share of frostbite and hot chocolate. Since Frank and I escaped Michigan and Ohio as soon as we were old enough to drive, that holds about as much appeal as getting a daily colonoscopy. We've opted to use the precious school vacation time to visit our favorite islands, for some fun and hopefully some sun. Arriving in the Honolulu Airport is a bit confusing, and since there seems to be law here against proper signage, we spent about 45 minutes looking for our baggage claim carousel. We finally found it, but the thing had not even started up. Alex became entranced by a nearby trolley selling leis, and wound up with an orange lei and head piece made of silk flowers. He wore his orange flower headpiece over his Texas Longhorns baseball cap, which made for an interesting ensemble. He charmed the lei-seller with an impromptu and spirited hula, made up on the spot just for the occasion. Eventually, our bags emerged and we loaded everything onto the Hertz shuttle bus. We found our car and discovered that it was a red Ford Mustang convertible. "Is this a Ferrari?" Alex asked excitedly. "No, this is a Ford. This car wants to be a Ferrari when it grows up." I quipped. Alex threw me a quizzical look, then said, "It's the coolest car ever!" Coolest car ever or not, the car had one significant short-coming--almost no trunk space. We're veteran travelers, so we know better than to over-pack, but our 3 suitcases would not fit into the trunk, no matter what. Frank's large duffel bag wound up strapped in with a seatbelt into the back seat, so that it would fall over and crush Alex or suddenly lunge forward and cause Frank to have a traumatic brain injury if we happened to stop short. Remember how a few months ago Frank showered me with flowers for our tenth anniversary? We got a number of nice comments on my blog and the Silicon Valley Moms Blog from women who referred to him as a "keeper". The Atlantic Monthly's column "Word Fugitives" that month asked readers to come up with a word to describe a husband whose over-the-top romantic gestures makes other guys look bad. Frank wrote in, saying, "According to my wife's blog readers, that's called a keeper." The Atlantic Monthly has written it up in their "Word Fugitives" column this month along with a few other entries, including a few less-than-kind ones. Frank is specifically quoted, with a follow-up quote by a woman who coined the phrase "wifesaver" for this type of guy. Yesterday for Valentine's Day he sent a dozen red roses and a dozen yellow roses to my office, brought home a box of gourmet chocolates and a beautiful card. So, I definitely think he's a keeper or a wifesaver or just an all-around good guy. Alex has been taking hip hop dance lessons as part of his after school daycare. Last week, I got to watch the kids do a short performance of what he had learned. It was pajama day, so all the kids are wearing PJs. I have no idea what the music is, but it sort of sounds like the theme to the X-Files on this video from my phone. Before the performance, he wanted to practice the routine, but the only hip hop music I have in my CD collection is Salt 'n Pepa from 1993. Now that's old school. We played a song for him to dance to, but the lyrics were not exactly family-friendly. I think he was concentrating on his moves, so he didn't notice some of the more colorful lyrics or at least that's what I'm telling myself. I usually find out that I'm wrong about this type of thing when his teacher says something like, "Alex was singing 'I like big butts and I cannot lie...' during recess. Please ask him not to do that again." I don't even know where he heard that old chestnut. I have to say, the kid really can bust a move! He is, of course, the one in the front in the red and black pajamas. Solid Gold Dancers, here we come! My mother never spoke Korean to my brothers and me when we were kids. That is, unless she was angry. When my mom got mad, so mad she could spit nails, the way we could always tell was when she started speaking shaking her head and speaking to us in Korean. She rarely spanked us, but when mom "Went Korean" on us, we knew she meant business. It meant, "Mama is having a moment and if you kids don't clear out, then...things are going to get ugly." We usually retreated to our rooms and didn't come out until she was calmly sittng down and watching TV with a bag of dried fish in one hand and a Little King Cream Ale in the other. The tirade usually started with something like, "Aigo...!" and went downhill from there. I once asked her what one of the words meant, and she said, "You don't want to know." She muttered something about "flies that eat poop" and "women who do bad things for a living." 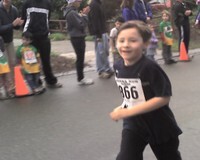 This morning, Alex ran in a race to raise money for our local PTA. He came in 7th place in a pack of about 20 boys of his age. Not the fastest runner, but good enough to qualify for a prize and a ribbon. He probably would have placed higher, if he hadn't stopped to wave at the crowd gathered to cheer the kids in toward the finish line. After the race was over, I asked him how he felt about how he did. He said smiling, "Great! I didn't fall down!" Last year, he participated in the kindergarten race and bolted out to the front of the pack. When the kids came in to the finish line, he was nowhere to be found. The very last kid came strolling in, carried by his dad, but still no Alex. I started to panic and wondered what happened to him. People started walking on the course, and a few minutes later, they announced, "Another runner coming through...clear the course." The crowd parted and Alex came running full-speed down the street, with a pained, but determined look on his face. I caught up to him and asked him what happened after he crossed the finish line. "Someone tripped me and I hurt my knee!" he said as he pointed to his bloody, scraped knee, visible through a tear in his pants. Both elbows were scraped as well. We had to seek medical attention from the first aid tent, which meant he got to tell his war story to a fireman who was on hand to clean his wound and put on some band-aids. "I got hurt, but I still finished," he told the fireman. "It hurt, but I decided to finish the race." "You're a brave boy!" the fireman told him, which made Alex beam with pride. He showed all his friends his band-aid and told them, "The fireman said I'm brave!" One girl offered to sew a butterfly patch onto the hole in his pants leg. When I was a kid, I would have been humiliated by coming in dead-last in a race or test of any kind. I would have packed up my sneakers and moved on to something else. Not Alex. He looked at falling and finishing as the same accomplishment as running and winning a prize. For him, the joy was in the running, not the winning. For this month's Rolling on the Floor Laughing (ROFL) award, I awarded Mr. Nice Guy, another NYC daddy blogger who consistently cracks me up. His post, "Official Nice Guy Endorsement: Parenting!" was probably the funniest thing I read all month. He reviews Parenting magazine and shows it for what it is: the mommy version of Seventeen. I can only imagine what he might have done to skewer Cookie. ...with its beautiful baby doll-models and 22-year-old coke-skinny covermoms. february's issue in particular caught old eagle-eye nice guy's attention for a couple reasons. first of all: have you ever looked at the cover, directly above the bold printed "PARENTING?" no? take a gander some time. there, hovering over the magazine's very name, you will read this line: "what matters to moms." oh yes they did! PARENTING magazine puts it right above their own name: parenthood is for girls! Congratulations, Mr. Nice Guy, and thanks for making me laugh out loud in an otherwise cold and dreary month. You can find a complete list of winners over at Izzymom and Mommy Off the Record. Where in the World Should Frank Go? My husband, Frank, asked me to solicit your opinion on "Where in the World Should Frank Go Next?" It’s because of him that I have now been all over the globe, including places I’ve always wanted to go (Easter Island) and some I haven’t (Bimini). Most have been great experiences (Galapagos), with a few that have been less than stellar (Delhi). Frank got bitten by the travel bug about 25 years ago as an exchange student, traveling around Europe on a Eurailpass. He realized on one of those train trips that he had been in more countries than his age. That’s easy to do when you’re 21, he says, "but it gets harder as you grow older and have already used up the nearby, easy-to-reach countries." The beauty of travel never goes away, whether you're 21 or 81. Traveling forces you to see new things, get a different perspective, and keeps your mind fresh and open. Travel gives you the sense that the world is full of possibilities and changes your assumptions about yourself and other people. Traveling with a child gives you an entirely different perspective; it makes people soften and welcome you to places you might not see on your own. We have definitely had good trips and bad trips, but he benefits have far exceeded the problems. Frank is convinced that Alex is rarely sick, not because he was breastfed or genetically lucky, but because he has tasted the dirt of 5 continents. According to Frank's official official count, he’s been to 56 distinct countries, which is ahead of his age, but not even half of the 192 members of the UN. In the last few years, he discovered the Traveler’s Century Club. The Traveler's Century club has a standard country list of 315 countries that includes colonies, territories, and self-governing islands. So, Hong Kong counts as a separate country from China, and Puerto Rico counts separately from US. In order to join the club, you need to have been to at least 100 places on their list. By their count, Frank has now been to 99 countries, and is ready to enter number 100. By their their standards, I've been to 45, so I'm ready to catch up with my age (46) by going to another country this year. 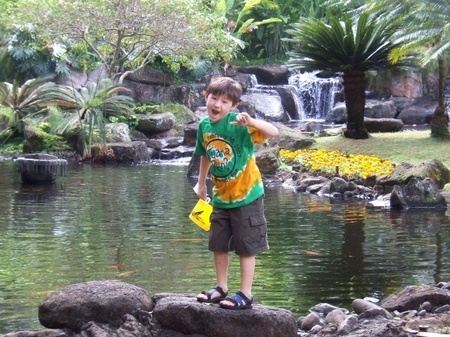 Alex is way beyond his tender age of 6, with 21 countries under his belt. Frank has added a few countries by adding a leg to a business trip, usually a weekend jaunt that takes him to a nearby country or island. Last year, he added Estonia, Finland Poland, Menorca and St. Pierre that way. The two of us took a day trip on a bus to Slovakia ten years ago and spent most of our time trying to cross the boarder with a busload of prostitutes and factory workers returning home after a long night of work in Austria. Sometimes the short trips are fun and worthwhile, and sometimes, not so much. Visiting your 100th country is a milestone, and it should be something special. So, we’re looking for opinions on where we should go for Frank's 100th country visit. Where should he go? Should he take the family, or just get it over with by hopping to Mongolia on his next business trip to Asia? 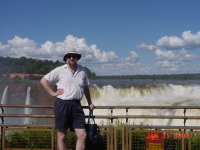 Photo: Frank at Iguazu Falls, Argentina in 2004.